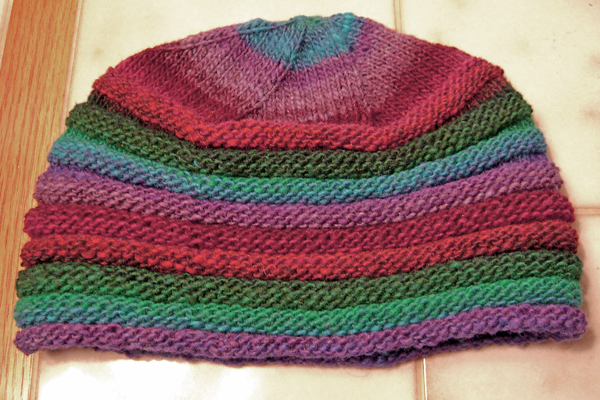 I finished the Noro hat on time for the gift exchange yesterday. The recipient seemed pleased with the gift! I love Noro. This is Noro Kureyon colorway #159. Look how the stripes just naturally changed at every purl row group, so it looked like I did something really, really hard when in reality I did nothing at all but knit around and around. Magic like that is just too cool. I used about 1-1/2 skeins. Some of it went towards matching the stripe sequence when the color changed abruptly at a knot as Noro yarns are so fond of doing. As I said, I love Noro. But really, if one pays that much for a skein of yarn, shouldn’t one reasonably expect that there will be no knots? And if there is a join in the middle of the skein, that the color will at least match? Just saying. Anyway… 1-1/2 skeins of Kureyon, size US#6 needles, simple beanie pattern, about 4 hours worth of knitting (partly wasted when I didn’t like the top the first time and frogged it out). Sorry for the really horrible picture. It was dark (naturally) when I finished the hat, and since I had to give it away the next day there was no time for a daylight pic. Of course I have a new pair of socks on the needles. Not much chance of actually finishing any of those UFOs right now. But we’ll see what the holiday vacation brings, eh?